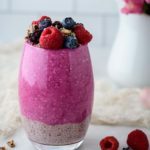 Brighten up your morning with this Dragon Fruit smoothie layered with chia pudding. So simple and delicious! Place a layer of chia pudding in the bottom of a glass. Layer with smoothie and top with fresh fruit.